"An expression of North Korean folk music into today’s sentiments" "A contemporary interpretation of the spirit of Hwanghae-do (the western provinces of North Korea)"
In celebration of 70 years of Korea's liberation, JGAH aims to express the true meaning of liberation and South Korea's desire to be one. In order to accomplish this, JGAH has formed a program using primarily songs from the northern regions of Korea. 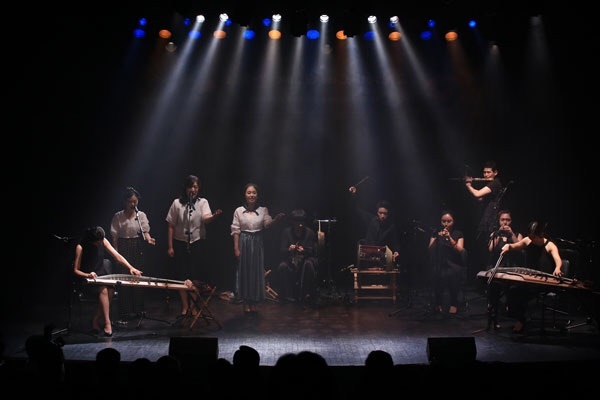 While for the past few years JGAH's works have centered on southern music styles including pansori, the works presented in this concert originate largely from the western provinces of Korea. JGAH’s purpose in utilizing the music from gut (spirit ritual music) and minyo (folk song) of the western provinces is to share and communicate with the audience the intense energy originating from gut and minyo. In particular, JGAH presents a staged performance of the energy which comes from the spiritual rituals of the Hwanghae province in the west, which compared to that of other provinces is relatively un-theatricalized. By doing this, JGAH utilizes the music principles of the western provinces to create a unique and distinguishable sound. Now in its 16th year of operation, JGAH is a talented traditional Korean music performance group based in Seoul, Korea. In 2009, JGAH was the recipient of the KBS Traditional Korean music award, and consistently leaves a memorable impression at their performances on stage in main events such as the National Theatre of Korea Yeowoorak Festival, Ulsan World Music Festival, Jeonju International Sori Festival, Incheon Pentaport Arts Festival, and more. Starting in 2005, JGAH’s talent began to be sought out outside of Korea, all over the Americas and Europe, to countries such as the U.S., England, Spain, Italy, Denmark, Brazil, Mexico, and more, and early this year was invited to the reputed Hong Kong Arts Festival, Asia’s largest international arts festival. JGAH has released a total of 5 albums from the past 8 years together with Akdang, a recording studio which consistently produces high standard traditional Korean music albums. The first album, Julpoongnyu, was praised as an excellent interpretation of the order and harmony of fluidity inherent in Korean classical court music. Praised for its excellence in interpretation of the depth and aesthetics of traditional Korean music, JGAH situates traditional music not merely in the past, but in the here and now, as music which breathes together with the present. Starting in 2014 in collaboration with METAA Co., Ltd, JGAH has been managing the Namsan hanok village and Namsan traditional theater, holding regular hanok concerts in Seoul titled "Hanok, reviving Korea’s poongnyu." Additionally, in 2015 JGAH formed a project team called Akdan Gwangchil for which concerts are continuously being organized. "AkDan GwangChil Concert" is presented by Korean Cultural Center NY in partnership with Flushing Town Hall.